Call it maker, handcrafted, or handmade, a new DIY movement has taken off big time. The common thread that ties makers to DIYers and handcrafters is the desire to build something rather than buy it. 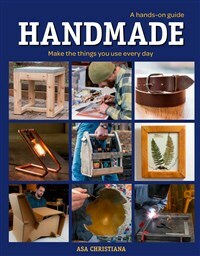 Handmade: A Hands-On Guide celebrates the movement and would-be makers with practical, doable projects that require only simple tools and techniques to complete. Author Asa Christiana is the former chief editor of Fine Woodworking, the most respected woodworking magazine in the world. 25 accessible projects...accessible yet doable with a modest collection of simple tools and made from all sorts of materials—concrete, leather, digital tools, Arduino, welding, casting, and printing.